I am writing this post as this week is Freshers week and for the first time since my teenage years I've become a student myself. I do feel like I'm having a quarter-life-crisis. I didn't go to University like most of my friends. When you're at school there is sometimes so much pressure to apply to University and not enough support with other career options. It's hard working out exactly what you want to do, and working out what path you want to take, especially when you're only 17. I went straight into retail after completing my A levels, starting as a christmas temp and working my way to management level. I am thankful for how much experience and knowledge I gained from those years in the industry which has helped me achieve what I do today. I hate that question in interviews, 'Where do you see yourself in 5 years time?' If you had asked me 5 years ago if I'd be running my own business selling vintage clothes I'd have never believed you. I think a silk scarf was the only vintage piece I owned at that time in my life. You can't always have a plan, life is always full of changes. If you're unsure about what you want to do a quote that I have always found helpful is 'start where you are, use what you have and do what you can!' and if you work hard the rest will follow. Coming from a retail background I knew a lot about sales, fashion & styling. This was all I needed in the early stages but as my business has progressed I've found there are a lot of things I've had to learn along the way. Things I'd not touched on in my previous roles before, such a marketing, and finance. It's never too late to learn, I'm going back to college this year to study an accounting and finance course to help me get a better understanding of it all and help run my business accounts a little more efficiently. I'm really excited and ready for the challenge. It's good to be put outside your comfort zone from time to time and dealing with numbers is most definitely out of mine. I know an accounting course is not exactly a fashion show, but like every other day I like to put thought into what i'm wearing. It's the first week of autumn it's been beautiful. I took advantage of this mild weather and wore an off the shoulder top. 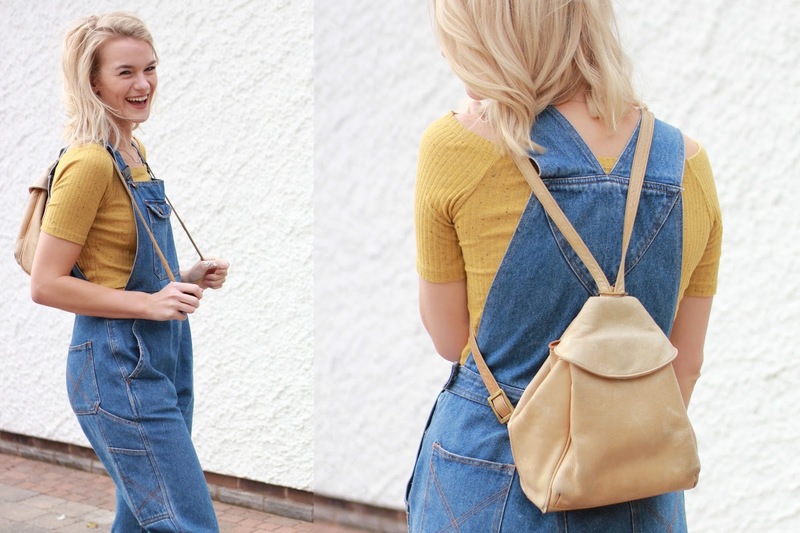 Although it's a little summery the mustard colour is a perfect shade for autumn. Denim never fails, I feel like these dungarees could get a lot of wear over the next few months. They are so easy to wear and comfortable, which you need when you're sitting in lectures. They are definitely one of my favourite vintage finds so far this year! Keeping with the autumnal theme I thought I'd dig out my burgundy converse, you can never have too many converse. I'm still getting used to my blunt bob I only had it cut this week, it feels so much healthier and thicker though. Nothing better than starting the new season with a fresh new hair cut. I've just applied for my NUS Extra card, just £12 for the whole year it is so worth having. After all those years of getting to the till point and having to sadly dismiss the extra 10% off I can't wait to whip out my new student ID. Just in time for the new season! I thought it would only be fair to dish out some discount on my website too. 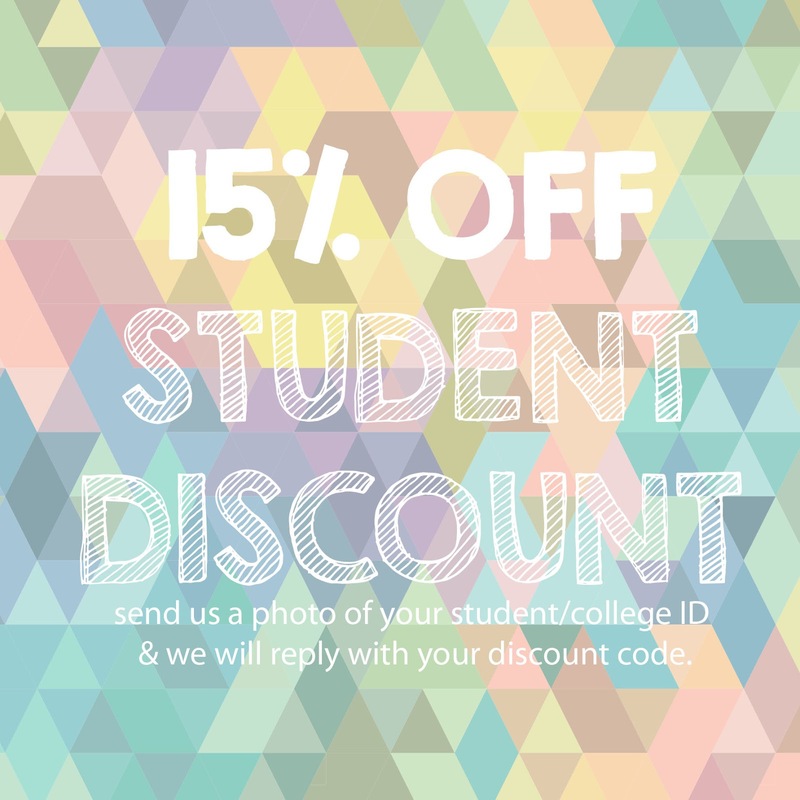 If you email over a photo of your student ID I'll reply with a discount code that you can enter at the checkout! If you have just started university, college, or a new business venture, good luck, make memories & remember to have fun! My love for the roll neck jumper started last year, I picked up a couple in the ASOS sale and pretty much lived in them from October to March. This year it's turned into an obsession so I felt the need to share it with you. I literally can't get enough of them. They are such a great basic piece to have in your wardrobe that can be used for a multitude of outfits. As you can imagine I was delighted when I came across some 70's roll neck jumpers at my most recent hand pick. They are perfect for mid-season, we can carry on wearing our favourite summer slip dress for another month at least *YEY*. Layer over a roll neck and you've got autumn covered. I've been wearing one under almost everything lately, especially now the weather is changing. My favourite look for every day is layering this simple denim dress over a roll neck jumper, I picked navy as I wanted to double up on the blues. I finished off the look with my beloved Whistles chelsea boots. I'm enjoying bare leg season until the bitter end. Another one of my favourite options is my ASOS shift dress, I've giving the dress a real retro feel by wearing it over a roll neck (in my all time fave colour mint green). The white & mint green give the outfit such a fresh feel. I completed this look with my white snakeskin platforms & lilac glitter socks, the platforms are only from Primark but I'm really impressed with the quality and how comfortable they are. I worked a roll neck into something a little more dressy last weekend. I've absoluty loved wearing this flared jumpsuit over summer. It's so flattering and comfortable, I'm not prepared to put it away with the rest of my summer wardrobe. My autumn favourite saves the day, this time a trusty white roll neck however I think black would have worked just as well, keeping the look monochrome. Now I can look forward to wearing my jumpsuit even when it's a bit chilly. If you follow me on Twitter you'll already know that this month started with some bad news. The Vestire Vintage Fashion show I was taking part in at end of the month has been cancelled due to sudden closure of the venue. I was really disappointed as I was looking forward to putting my autumn pieces on the catwalk. I'd already done the buying for the fashion show before it got called off. However, It's not turned out to be bad news for everyone, at least you're in luck, the lovely vintage pieces I hand picked for the show are all for sale on my website - Including the heavenly 70's roll necks! Hope you have been inspired for autumn, mid-season is alway a hard one so if you have any top transitional trends please share!